Inside my Christmas beauty kit there are some products I'm wearing in this period, and a few classics, always indispensables on a beauty kit. This Christmas I want to put the focus on the lips, in red, burgundy, plum or in a vibrant fuchsia red. 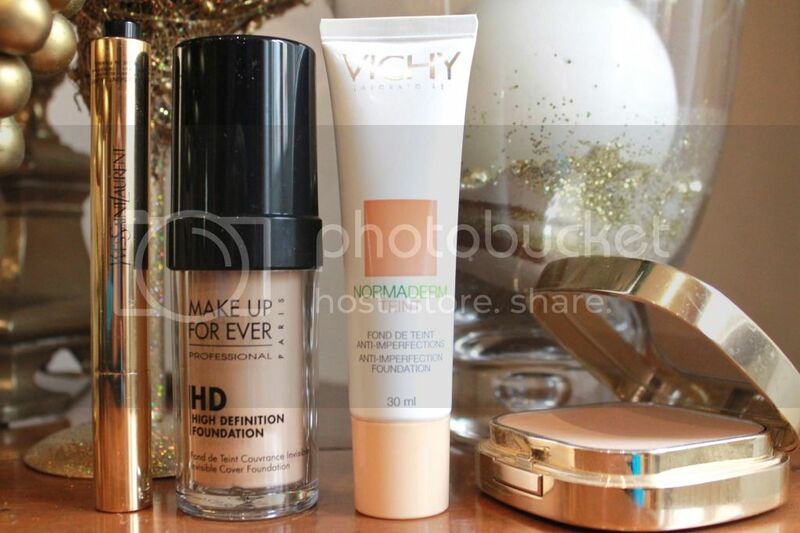 Since I have discovered it, my Make Up For Ever HD Foundation is my favorite. The reason: my skin always looks good and bright in photos. It's perfect for Christmas/New Year Eve's parties or family suppers. 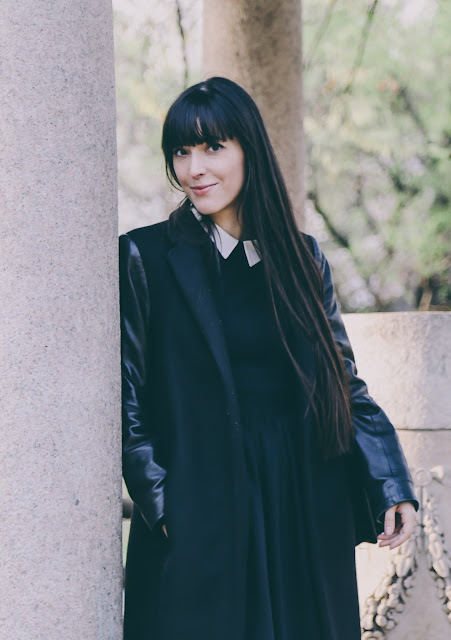 Vichy Normaderm Teint is perfect for days off. It's so light that you can wear it and forget to have it. It's also perfect for combination or oily skins. Or if you have eaten too much chocolate! 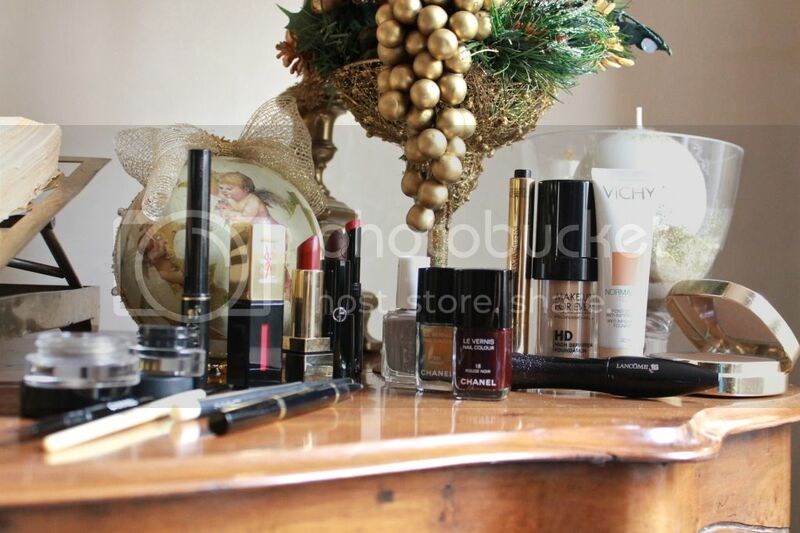 As a powder I use Dolce&Gabbana Perfect Finish Foundation. I know this is a foundation but it doesn't work in that way on me. On my skin it looks powdery. But, using just a little tiny bit as a powder, it works. I really want to change my mind about it but every time I use it as a foundation it am not happy about it. Don't forget a touch of YSL's Touch Eclat. I've purchased and repurchased it over the years, I definitely love it and I've planned to tell you (in the next future) the infinite ways to use it. The Bobby Brown Long-Wear Gel Eyeliner in Black Ink is always my favorite gel eyeliner. It need a longer application time than the pen eyeliner, but it gives a smoother and softer line. 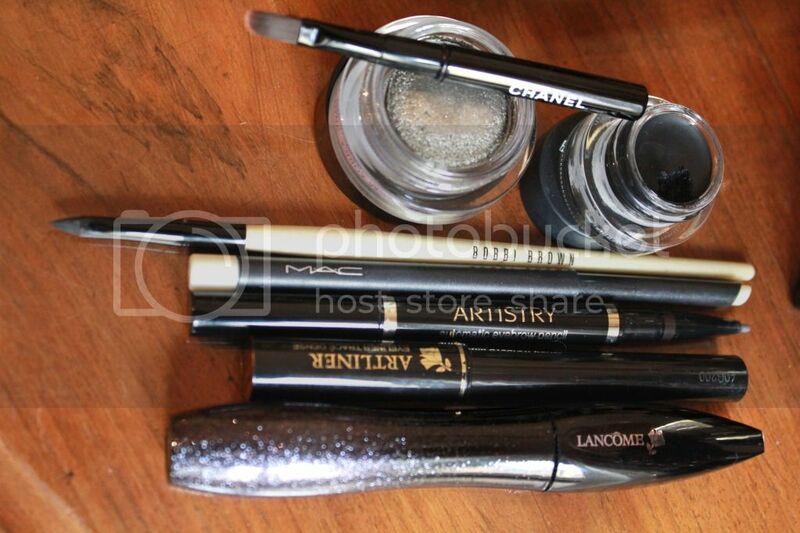 I apply it with Bobby Brown Ultra Fine Eyeliner Brush, also very good. Lancome Artliner in felt is a must-have. It's so easy to apply that I've started to do it even when I'm in train or bus! 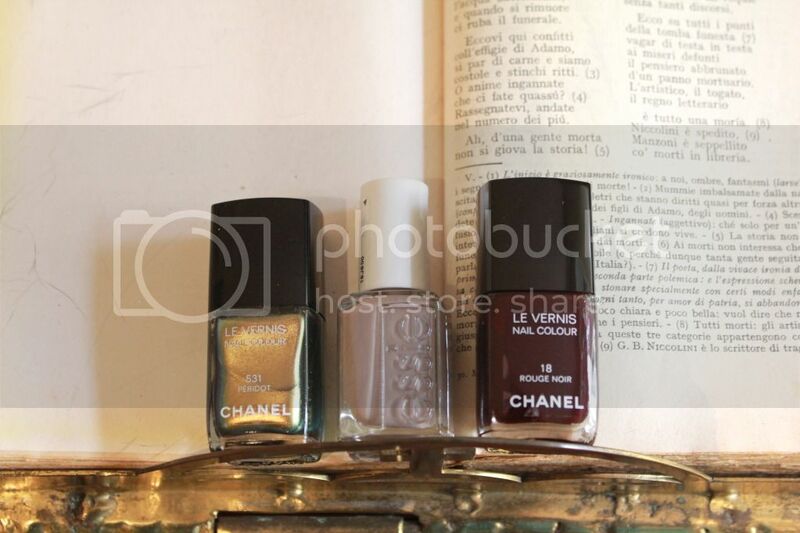 Chanel Illusion d'Ombre in Epatant gives always a shiny, metallic finish that is very on trend this season. For eyebrow I'm using Artistry Automatic Eyebrown Pencil that matches perfectly my eyebrow colour. I'm using also, on the top of it, Mac Brow Finisher in Clear. Right now my mascara is Lancome Hypnose Star, I love the glitter case and it's very good, probably not my favorite ever (I still don't have one) but I suggest you to try it. This Christmas I want to wear lipstick almost every day. I love lipsticks, I've bought any shade of red and purple so it's time to have coloured lips! First of all, I'm using lip balm a lot, in order to have hydrated lips, a must if you want to wear a dark colour. YSL Rouge Pur Couture Vernis a Levres in Rouge Gouache, a lovely and vibrant red/fuchsia. 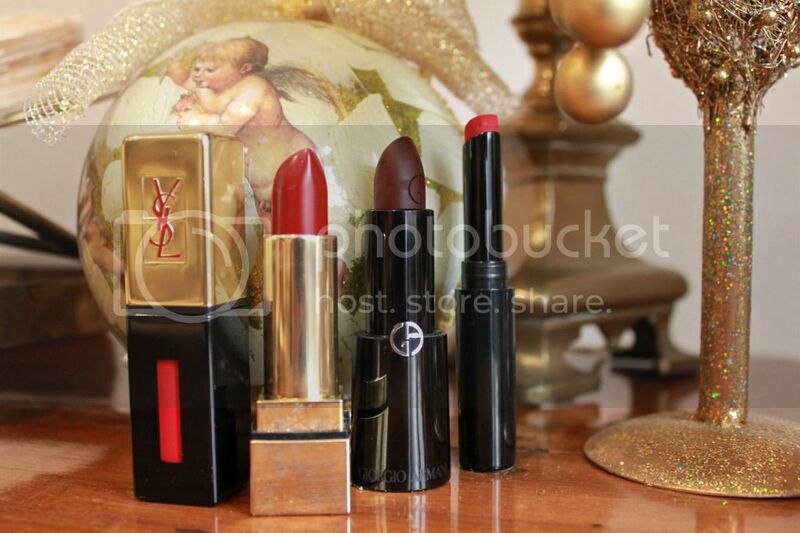 YSL Rouge Pur Couture in Rouge Pourpre, just a little bit darker than the classic red. Sephora Maniac Mat in 20, a long-lasting, deep and mat red. My Christmas' choices are all about classics. The absolutely feel-know Chanel Rouge Noir, always the best nail colour you can wear. For the Holidays special edition Chanel has re-edited this classic colour with a touch of ton-sur-ton glitter. The result has been called Malice. I haven't it (probably Santa Claus hasn't received my Chanel wish-list). From fall 2011 collection, one of my favorites, the metallic Chanel Peridot. If you have not so easy-going parents and you need to go for something less colored, there is Essie in Miss Fancy Pants.